Nazareth R.H.S., East Flatbush, basketball alum Darnell Williams was inducted into the Xavier University, Cincinnati, Ohio, Hall of Fame this summer. Williams graduated Xavier in 1999 and ranks 16th on the school’s all-time scoring list for men’s basketball at 1,572 pts. His freshman season was the Musketeers’ first in Atlantic 10 Conference play. He set the Xavier freshman single-game scoring record with 35 pts. and also led the team in points scored – a rare feat as a freshman. 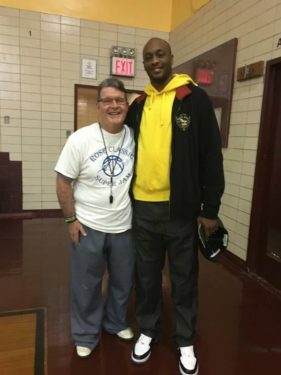 The East Flatbush native and two-time All-City selection at Nazareth helped lead Xavier to the NCAA Tournament in 1997 and 1998 and the National Invitation Tournament in 2000. As a junior, he led the team in scoring with 17.3 pts. per game and tallied 14 games scoring 20 or more pts.